A drum circle is a gathering of people playing hand drums and percussion instruments. In ancient cultures, sacred drumming was often performed by women for celebrations and ceremonies. 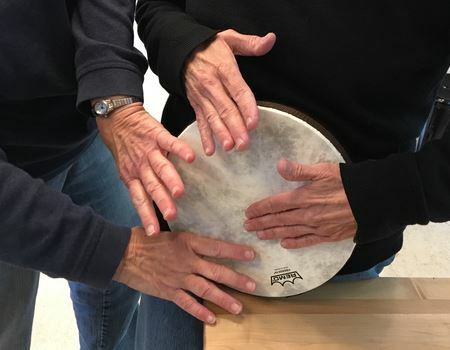 Drumming is a transformative tool and because it mimics the heartbeat, can often reduce stress and tension. A drum circle is an end in itself and is not in preparation for a performance of any kind. You do not need drumming experience to join this circle. You do not even need a drum. We have several “drum like” objects and several authentic percussion instruments that make wonderful sounds. We will begin with very basic drumming patterns and progress from there as the group is ready. This drumming circle interest group is facilitated by Shirley Gonzalez-Day (contact info below) and will be limited to 9 women. The plan is to meet monthly. Allergy alert: This is a pet home although the dog will not in attendance!